Holiday Club promises its customers relaxing moments. For the leading holiday housing and tourism company the well-being of its staff is highly valued and essential for fulfilling it’s promise. Firstbeat Lifestyle Assessment gave new insights on occupational wellness to the company management. General feedback on the employee well-being was also relieving: The staff is coping normally which provides good grounds for further wellness development. Holiday Club has employees with numerous job descriptions, from spa and hotel workers to sales and administration personnel, which represents both a strength and challenge for the company. Traveling, physical work, specialist tasks, shift work as well as stressful and busy situations set an additional challenge for the staff requiring stress and time management skills. HR Director Merja Kolehmainen saw Firstbeat Lifestyle Assessment as a chance to promote the employees well-being, regardless of job description. “Our Pension Insurance Company, VARMA recommended Lifestyle Assessment to us in August. They strongly suggested the Lifestyle Assessment since it provides the participants with valuable, personalized information on well-being. VARMA had recently conducted their own assessments and were very enthusiastic, which convinced us of the value of using the Firstbeat Lifestyle Assessment,” Kolehmainen explains. Soon a pilot with 29 participants was started. The pilot group consisted of the company management, supervisors, specialists and restaurant managers. 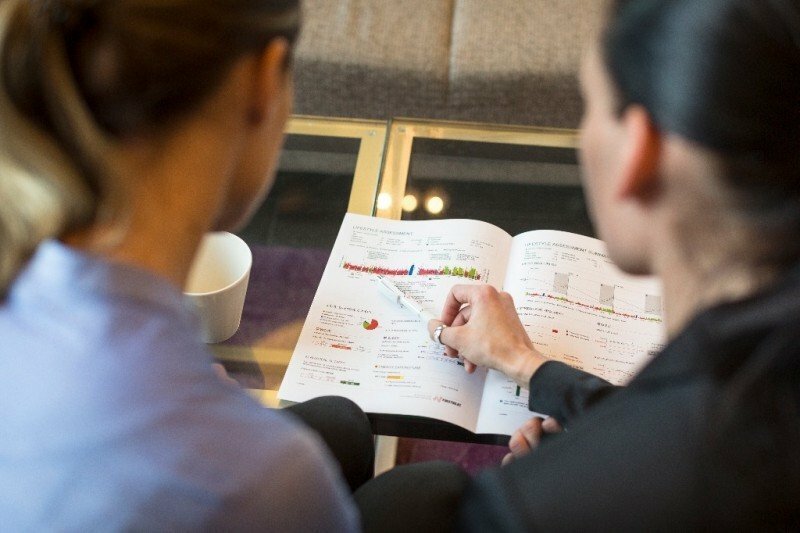 The measurements were carried out in the beginning of September after which Firstbeat Wellness Specialist Jaakko Kotisaari held a feedback session discussing the assessment results. Firstbeat composed separate group reports for employees in different roles which provided the Holiday Club information on the work load and stressful factors in different positions. With the experiment Holiday Club wanted to see how well Lifestyle Assessment works in practice and what it has to offer for developing occupational wellness. For future wellness development, the Holiday Club’s focus will be on promoting coping at work, supporting management work and encouraging conversation between the management and personnel. The company management plays an important role in spreading wellness information and actions throughout the whole company. Kolehmainen thinks that the participants clearly were nervous about the results. On the other hand, they were very excited, too. When the results were interpreted, many of the participants sighed for relief. “The group reporting proved that the share of stress and recovery are normal in this group. The topic of night time recovery was brought up and we were given good advice regarding it. As an employer we do not have such a good chance to affect night time recovery, which makes individual information extremely valuable,” Kolehmainen notes. On the other hand, recovery during working hours is something that the employer is able to influence. The average results were good. Part of the group is very physically active, though, which clearly affected the whole group’s activity level positively. In the future it is important to support those who do not exercise that much at the moment. “I found very relieving that my current state of exercise is enough to maintain my fitness and that my lifestyle enables recovery,” Kolehmainen explains. During the measurement, Kolehmainen also tested how energy drinks affect her body. Her heart rate increased after the energy drink without having any physical activity. Seeing this effect supports decreasing the use of energy drinks. Holiday club is currently considering a follow-up measurement.